The Kirchheimer Vokal-Consort t akes i ts name from the idyllic wine village of Kirchheim an der Weinstrasse in Rhineland-Palatinate. 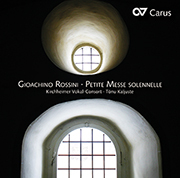 At the invitation of Dominik Wörner, ten musicians came together at the 2010 “Kirchheimer Konzertwinter” Festival to perform the Petite messe solennelle by Gioachino Rossini. All members of the double quartet are prizewinning soloists (ARD International Music Competition in Munich, Leipzig Bach Competition, etc.) and enjoy international opera and concert careers. At the same time, they have extensive experience performing in leading ensembles (Collegium Vocale Gent, Bach Collegium Japan, Sette Voci, Cantus Cölln, RIAS Kammerchor). Drawing on this background, the KVC has acquired an enviable reputation within a very short time. Its distinctive unmistakable sound, combining the best of solo and ensemble singing, has been much praised. They are accompanied by two equally distinguished instrumentalists. From the beginning the high artistic potential has enthused Tõnu Kaljuste, the director. 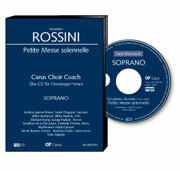 Following concerts under his direction, it was decided to make a CD of their interpretation. In the Noblessner Hall in the port of Tallinn, Estonia, designed by Ludvig Nobel in 1913 (the nephew of the founder of the Nobel Prize), the group found a fascinating place with an ideal acoustic in which to realize their project. During the Soviet period the building was used as a submarine factory. Pleading for peace, singing “Dona nobis pacem” in a former armaments production plant, has a strong symbolic power here.